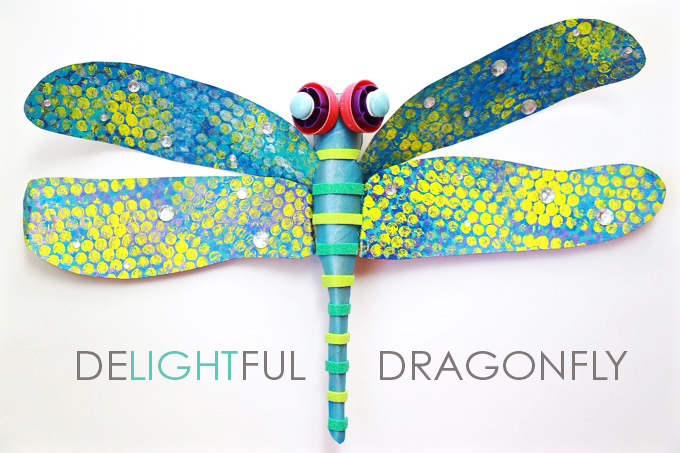 Check out our ~ DIY Delightful Dragonfly in the Mountain Parent online or in print! 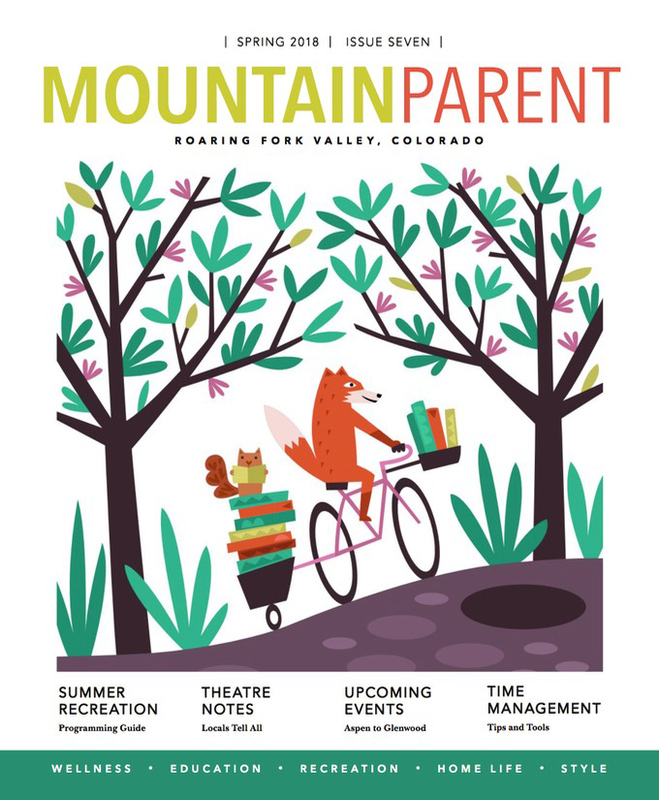 Mountain Parent ~ April – June is hot off the press and available at all your favorite locations throughout the Roaring Fork Valley! It’s such a wonderful resource for families. We’re so fortunate to have Lauren Suhrbier and Kathryn Camp leading the way on this beautiful + local + FREE publication! 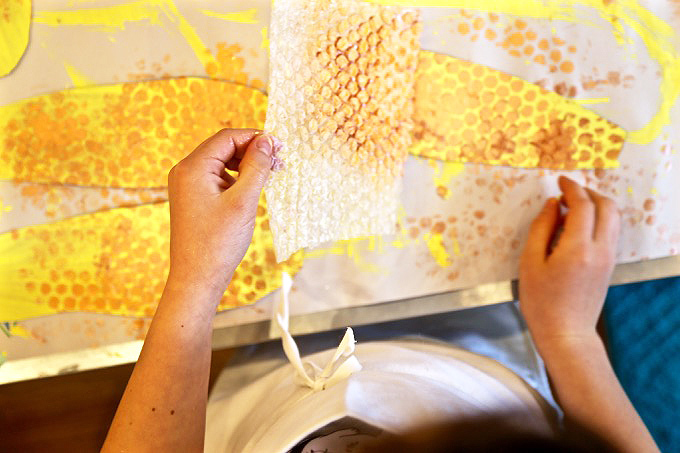 We’re thrilled to collaborate on our first DIY for this fantastic magazine! 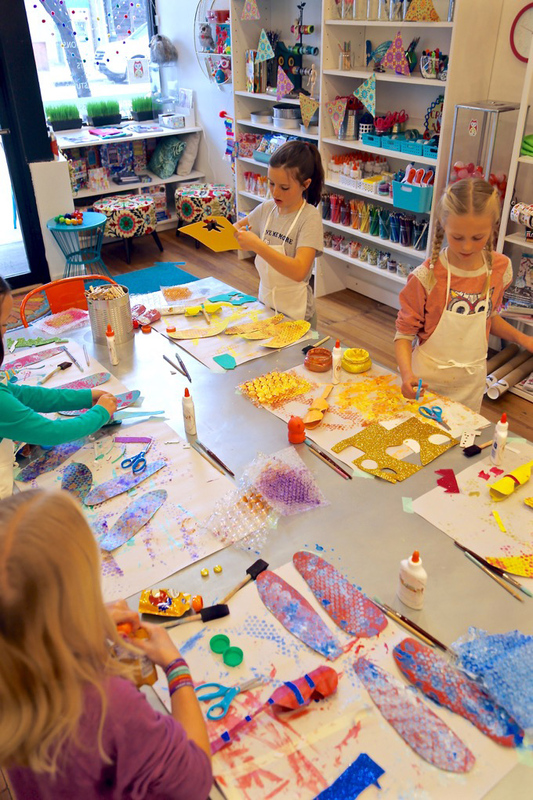 Pick up your copy, link into this marvelous mountain magazine, and take flight into our process, creating colorful + creative creatures with children! 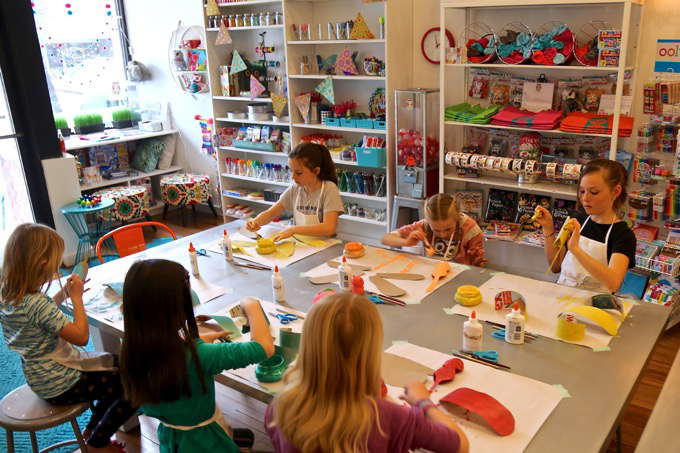 ONE Collect all supplies and prepare a space to create. 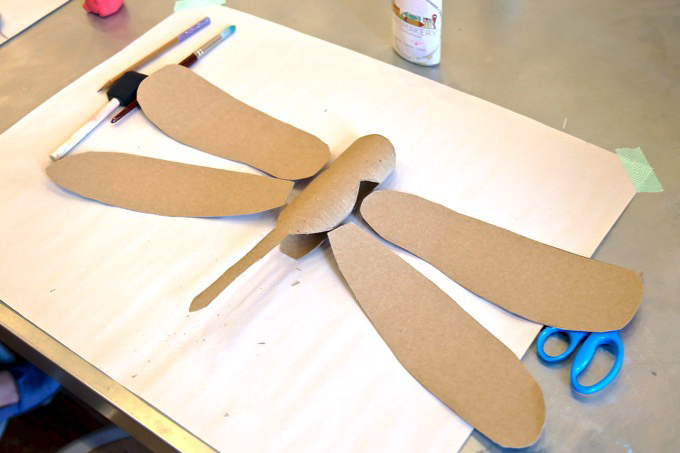 TWO Gently flatten one cardboard tube (paper towel length) and sketch a simple dragonfly body with a head, thorax, and long abdomen with a pencil. Cut with scissors, keeping lower half connected to provide a more 3D body. THREE Open a large cereal box. 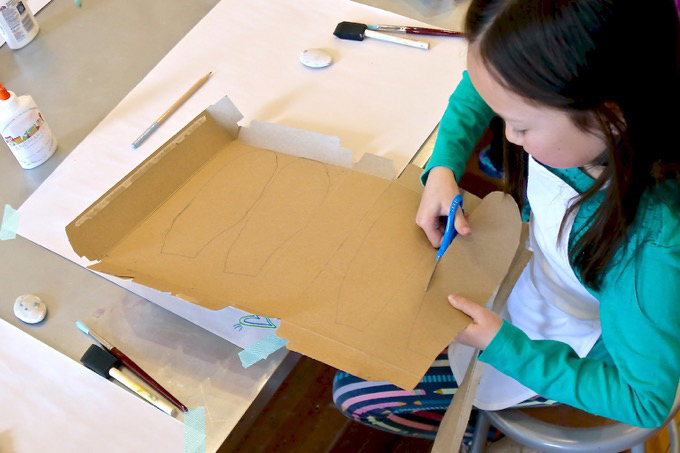 On the plain cardboard side of the box, sketch one upper wing and one lower wing. Cut out and trace so you have two of each. 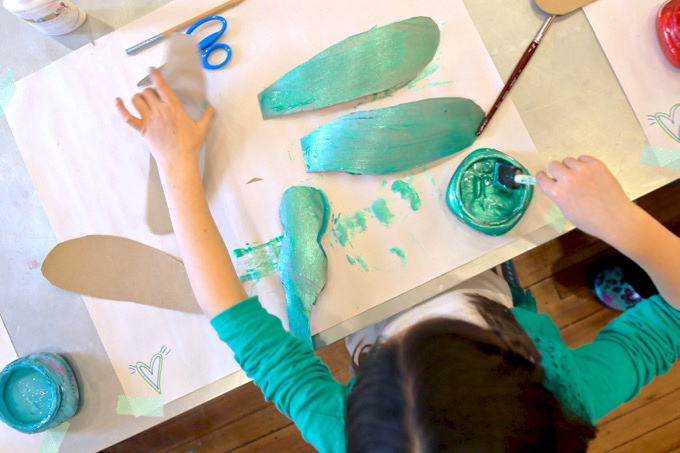 FOUR Paint a base coat using a solid color on the body (interior and exterior) and on all four wings (plain cardboard side). Dry. 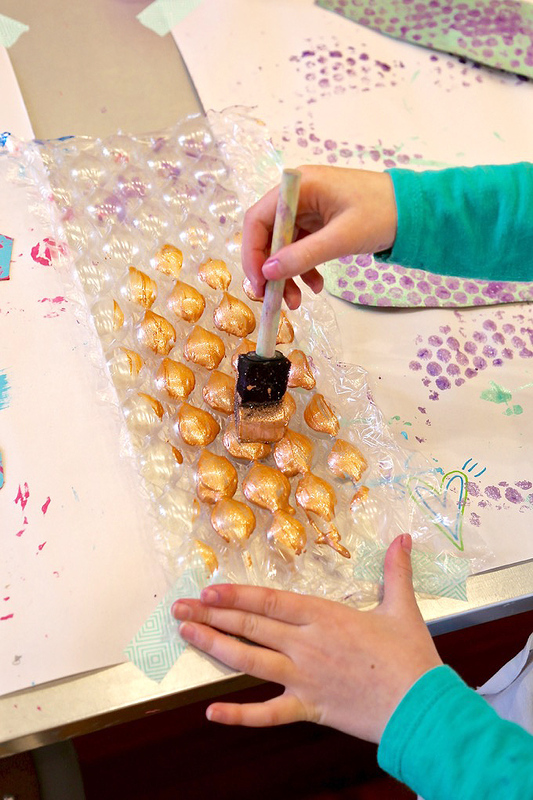 FIVE Paint bubble wrap with a sponge brush. Press painted wrap onto all four wings. Dry. Repeat this process with 2-3 different colors and different sizes of bubble wrap. Dry between layers. 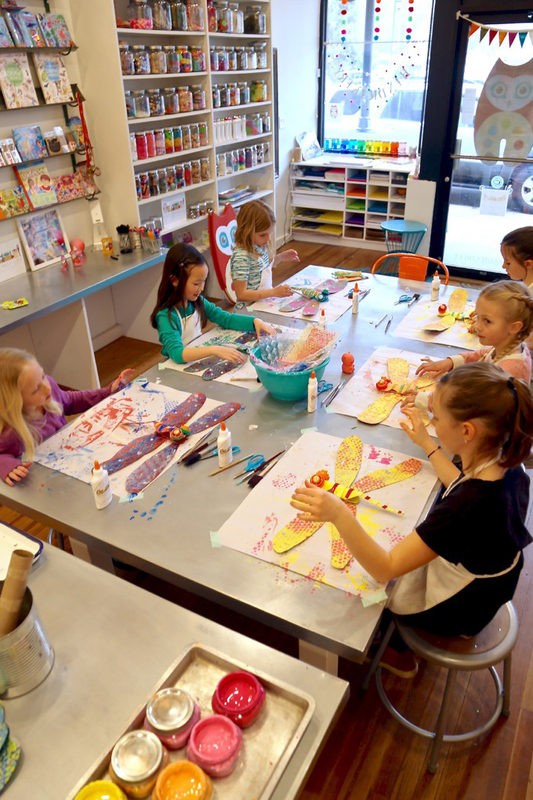 Using metallic paints are a fantastic addition! 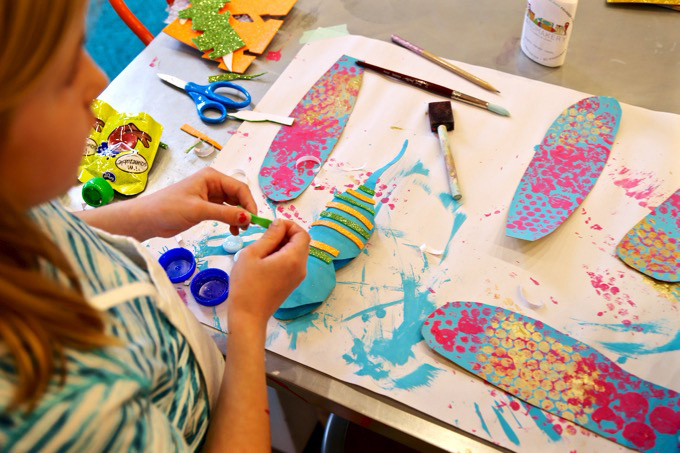 SIX Dazzle body with stripes using glitter sticky foam and decorate wings with sticky rhinestones. Be sure to glue sticky rhinestones as they don’t always adhere well without glue. 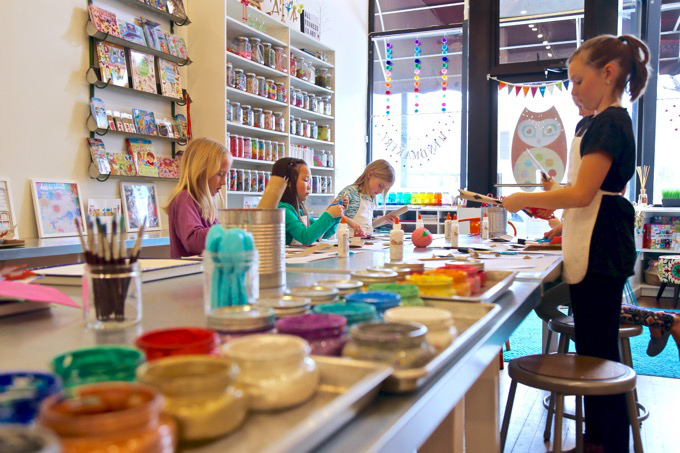 SEVEN Layer plastic lids to form eyes, small lids inside large lid. Keep eyes symmetrical. Hot glue. You may also add an aqua glass gem to eye center. Helpful hint: Hot glue a small circle of flat foam to the gem bottom so it adheres when glued to plastic. 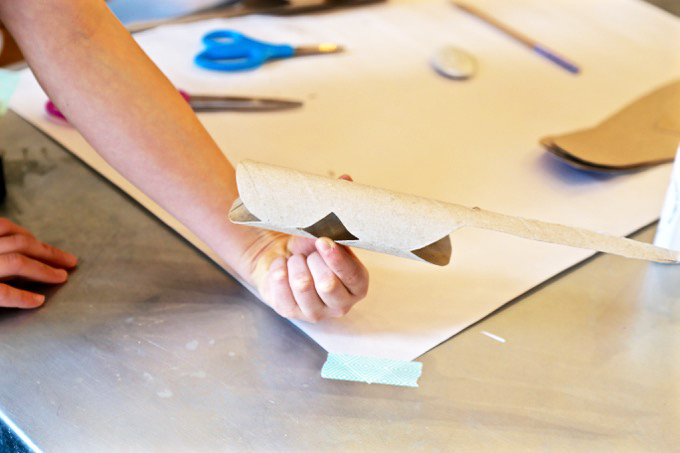 EIGHT Simply bend a flap on the end of each wing to attach to the body with hot glue. Hold in place to dry. Reinforce with additional hot glue. 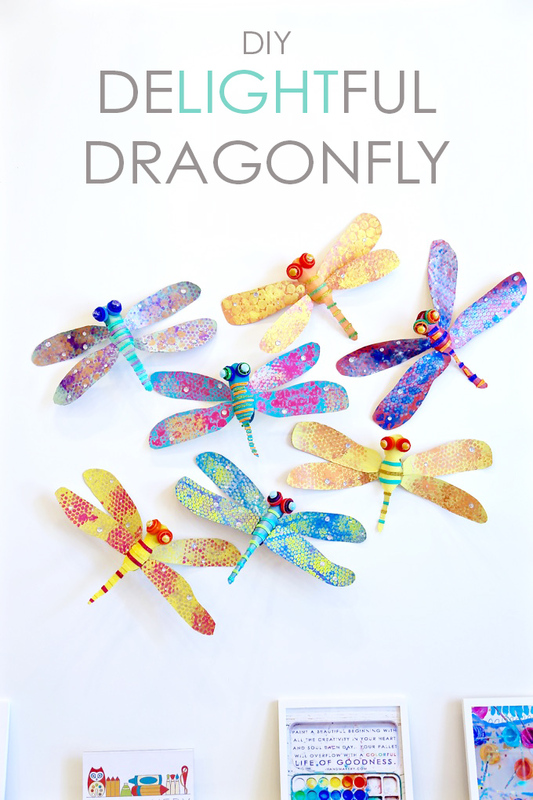 Name your dragonfly to personalize your creation! 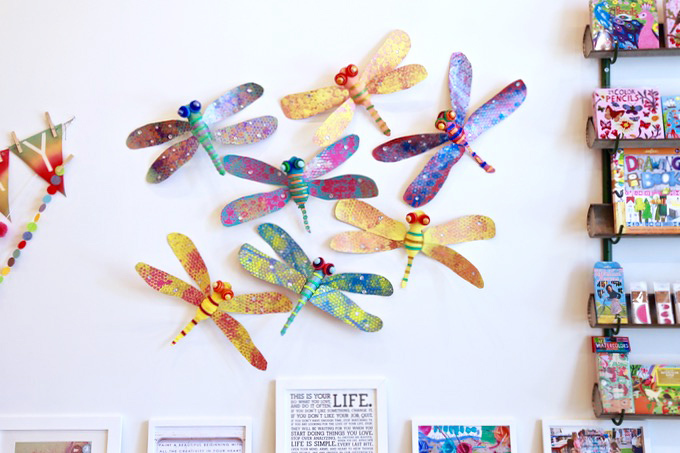 Please note: We created our DIY Delightful Dragonflies in approximately a two-hour timeframe with children ages 8-11-years-old! Attaching the wings to the body may take a little extra love + hot glue patience! 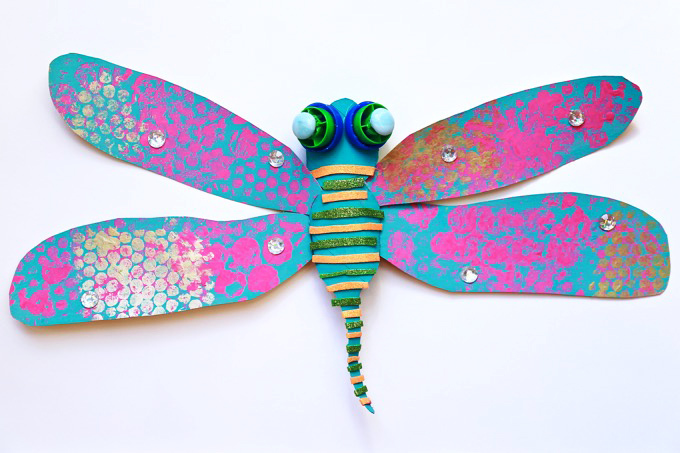 Dragonflies are insects with long bodies, transparent wings, and large eyes. They have a head, thorax, six legs, and a long segmented abdomen. The dragonfly is a great flyer. They can hover, fly incredibly fast, and even fly backward. Their speed can reach 30 miles per hour. 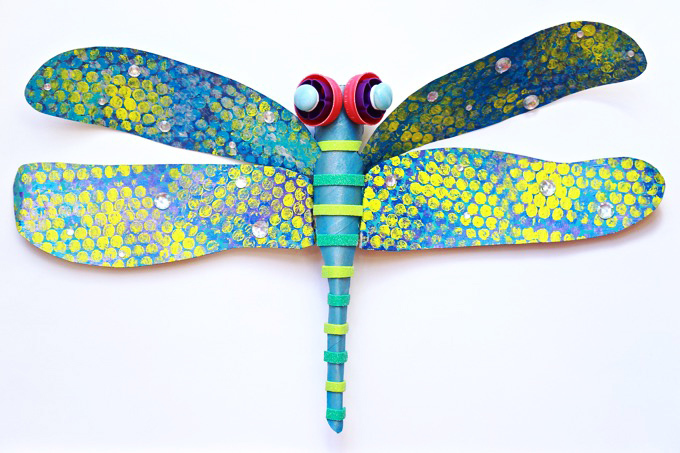 Dragonflies are incredibly colorful- red, yellow, green and blue. Size ranges from half an inch to five inches long. 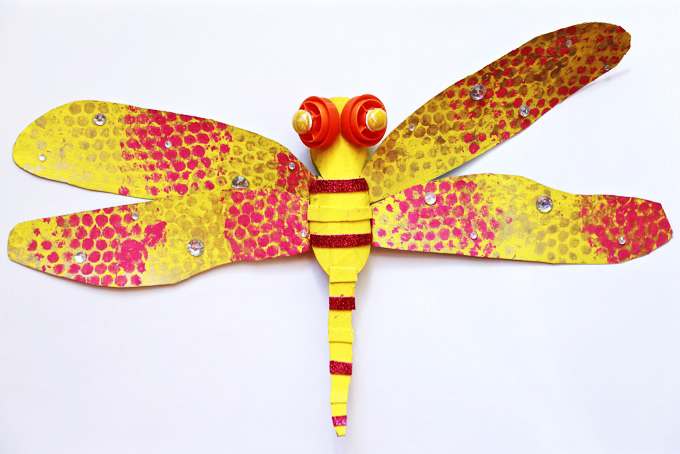 Dragonflies are carnivores and eat other insects, including mosquitos and gnats. They have been around for 300 million years. They don’t sting or bite.